1. Wash the cabbage well with cold water. 2. Place in a large pan of water to a boil and allow the cabbage with salt until al dente, so still crisp. 3. Cut the leaves than in medium-large pieces. 4. Fruit in the hot oil the minced meat with the fine-sliced onions shallots. Add the paprikapowder, pepper vetsin and crumbled bouilontablet monosodium glutamate. 5. Tie the cornstarch with water and add this on high heat while stirring. 6. 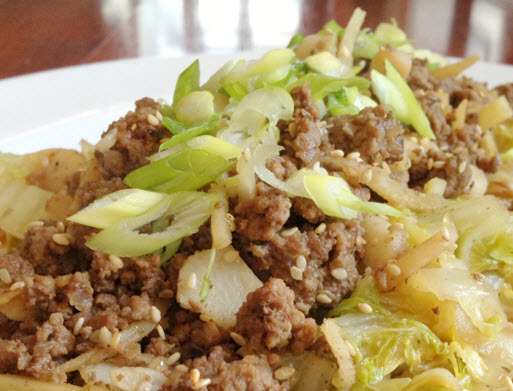 Spoon the cabbage on a flat dish and pour the meat sauce. 7. Garnish with slices of egg and parsley and serve this tasty cabbage dish with cooked rice.